A classroom fitted with wi-fi means that the children and staff are exposed to constant low-level microwave radiation. A small number of people are likely to suffer symptoms like headaches as a result. Everyone is affected cumulatively by this exposure and current evidence suggests that children may be more likely to develop medical problems during childhood, as well as cancers and other serious illnesses later in life. Of particular significance for children are studies which indicate that children absorb more radiation in the brain than adults which may indicate a greater risk of brain tumours. following day when I was again exposed to it. After eight days it became so bad that the school head agreed to switch off the wi-fi in my area. My symptoms stopped immediately. network from previously inaccessible locations. An HPA investigation into wi-fi in schools failed even to consider the health effects, only going as far as to take readings from wi-fi installations. Many schools are choosing to use wired rather than wireless computer networks. 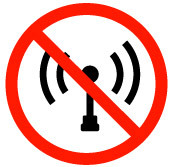 Read more...Some educational institutions are avoiding wireless networks on health grounds. 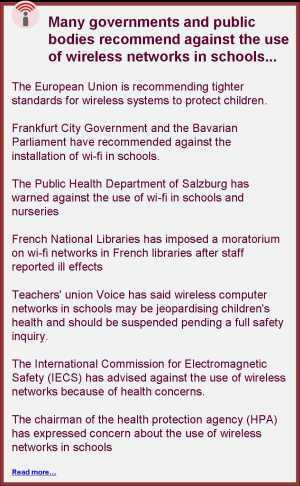 For the full picture on wi-fi in schools go to www.wifiinschools.org.uk.. 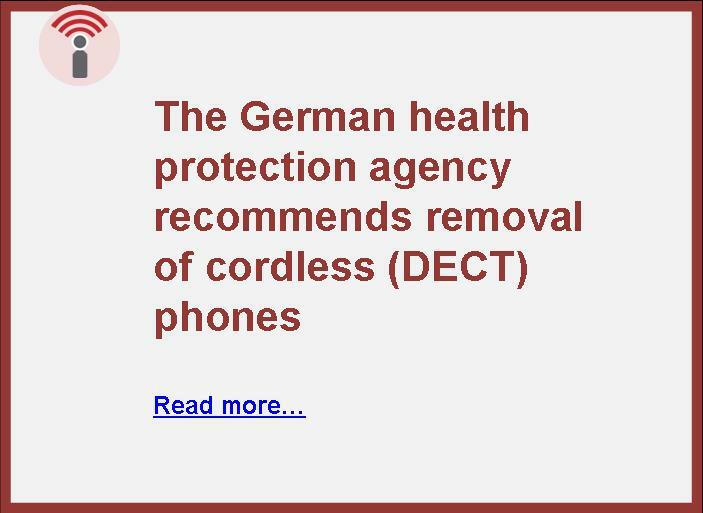 The alternative is to use wired phones or the low radiation cordless phone. 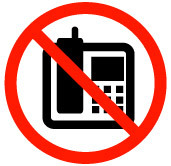 We recommend teachers, staff, parents and visitors be asked to keep their mobile phones turned off at all times within school, except maybe for short periods to listen to messages. Mobile phone calls should only be made when several metres away from children, and ideally outside the building. 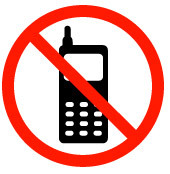 We also recommend mobile phone use by children be actively discouraged. Download a poster to support a mobile-free policy.